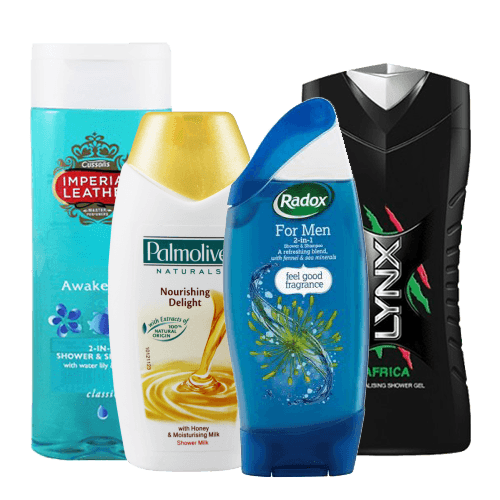 From mens shower gel to luxurious Imperial Leather Bath Creme, we've got a great range of wholesale bath and shower toiletries to carer for your customers every need. Give your customers the Lynx effect with wholesale Lynx Shower Gel - available in a variety of fragrances. We also have a great range of womens and childrens bath and shower products. There is really is something for everyone! We’ve been supplying toiletries to businesses of all sizes for decades and our selection of wholesale bath and shower products is simply second to none. From some of the industries’ biggest brands such as Adidas, Carex, Dove Lynx and Imperial Leather we stock a large selection of wholesale bath and shower products that help boost daily hygiene. For men who lead an active lifestyle Adidas Ice Dive 2 in 1 Hair and Body Shower Gel is perfect for refreshing and revitalizing the body. We also offer a number of Lynx wholesale bath and shower products such as Dark Temptation, Shower Gel Fever, Recover and Rise, all of which are infused with a fresh fragrance and help keep skin feeling fresh and clean after every use. Specially formulated for sensitive skin Dove Soap Original is perfect for all the family. So too is Imperial Leather Bath Crème, Imperial Leather Soap and Nivea Soap Milk. We also stock Radox Bath Moisture Soak and Radox Bath Stress Relief for those looking to enjoy a nice relaxing soak after a long, hard, stressful day! Toiletry Bags and Toothbrush Cases are perfect for those who are travelling or are constantly on the go. Along with our extensive selection of wholesale bath and shower products we also offer a timely and extremely reliable delivery service on all our products. As a leading supplier of wholesale bath and shower products we take great pride in offering an excellent customer care service. So if you have any questions regarding our wholesale bath and shower products feel free to call us on 01254 306840.